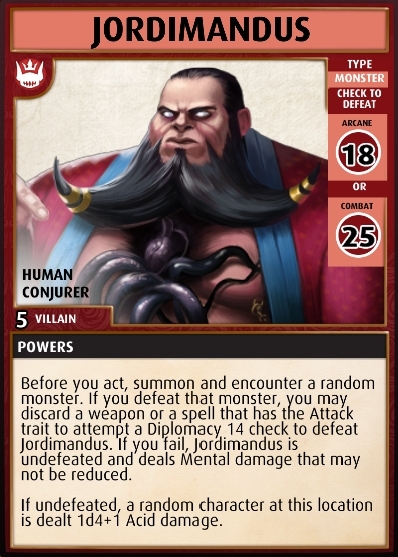 Build 7 “Stone Head” location decks using the deck list from this card plus 1 henchman. 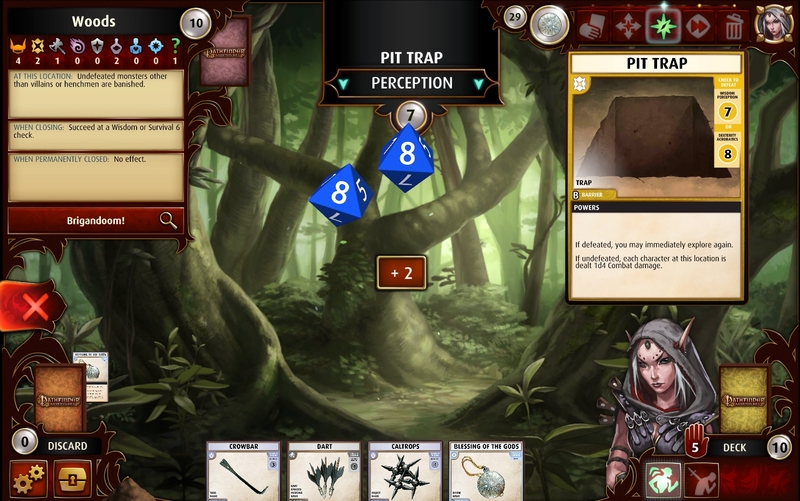 Characters may not move to the Sihedron Circle or encounter cards from its location deck until all Stone Head locations are closed. When you defeat a henchman, automatically close the location it came from, then each character at that location moves to an open Stone Head location. When all Stone Head locations are closed, all characters move to the Sihedron Circle. Unlike anything we've done so far! The good news is that you don't have to do any of that setup. I'm always trying to find the best thematic spots for locations on our scenario maps. This had a fairly direct representation in the pen and paper game. Check it! In the end you gotta face Arkrhyst in the middle with all hands on deck in an epic battle. 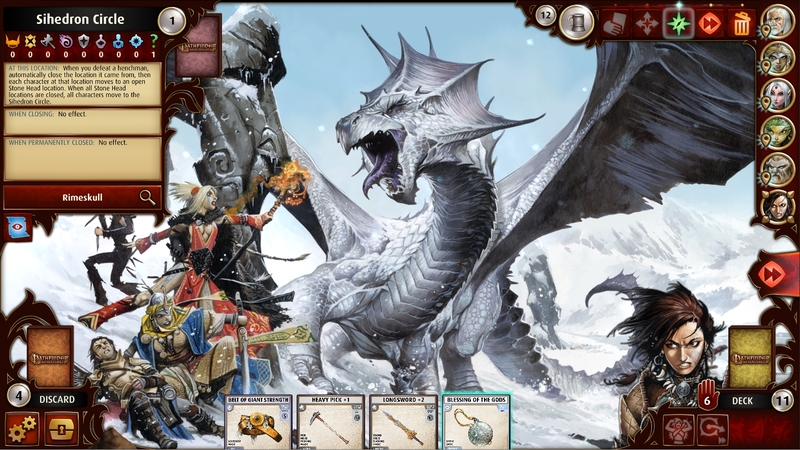 No easy feat as the dragon hits everyone with a breath weapon before the combat even starts! This location background is one of my favorite Pathfinder art pieces. Another of my favorite scenarios features not one, not two, but THREE villains. Each one more vile than the last. If you plan to tackle these guys in Heroic or Legendary Difficulty, plan your attack carefully. 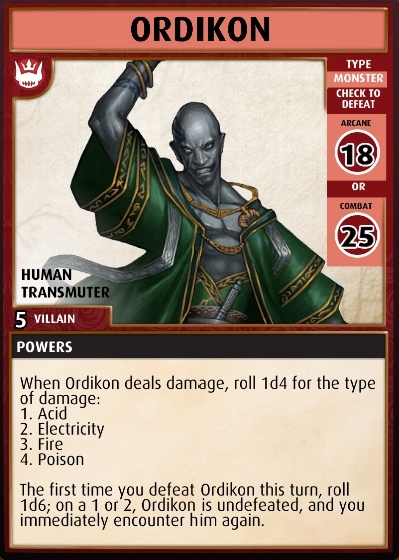 Each time a villain is defeated, the others become wiser to your ways as the difficulty to defeat a villain is increased by 5 for each villain that has been defeated. And if you didn't corner a villain the first time, he'll be back and stronger than before! Fortified Position: An additional barrier is shuffled into each location. Close Quarters: Your hand size is decreased by 1. 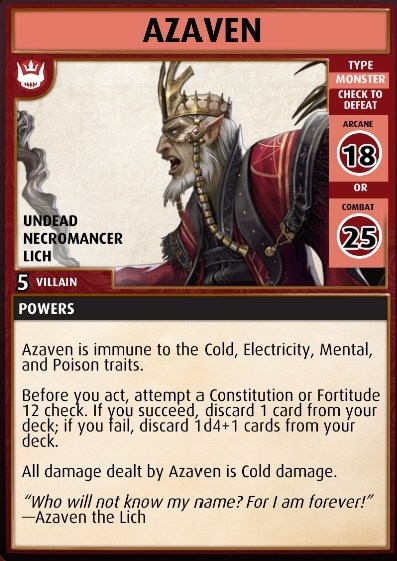 If you make it through Deck 5's Legendary difficulties, a fantastic new blessing gets added to your collection. The Blessing of Thassilonian Virtues asks you to forsake other gods, banishing another blessing in order to acquire it. Once you've bought into the seven "virtues" that ancient wizards used to grow in power, all spells become easy to find, you own any place you find yourself, and you can mock the gods of Galarion at your leisure. 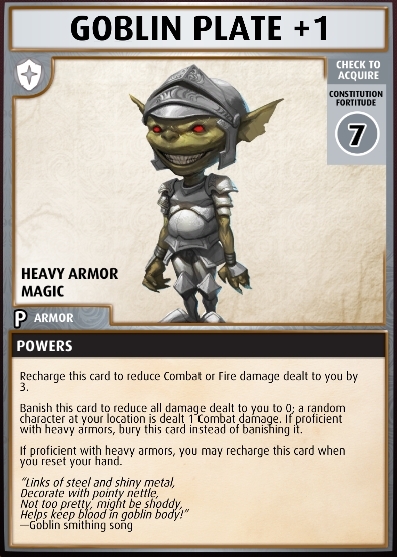 And for those of you with the bundle, life isn't complete without some armor made with the skill, precision, and love that only a goblin can give. This update also includes some brand new Treasure Cards! 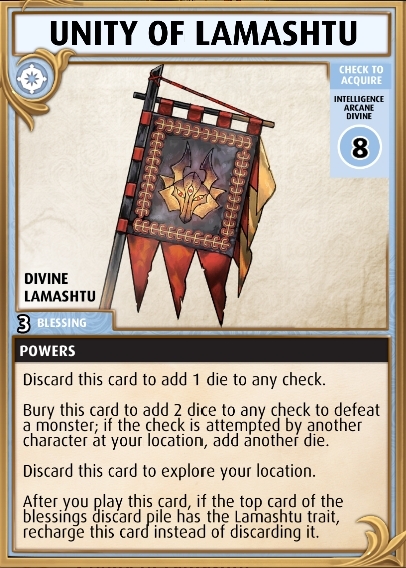 This includes two new flavors of blessing card. First, "Unity" blessings. 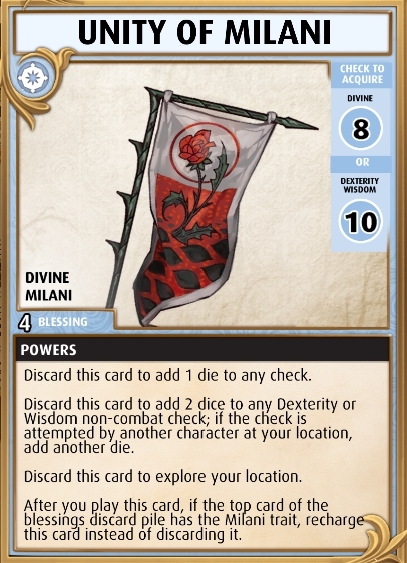 These are similar to blessings you have seen before, but have the ability amplify their power if you played on the right check on another character at your location. 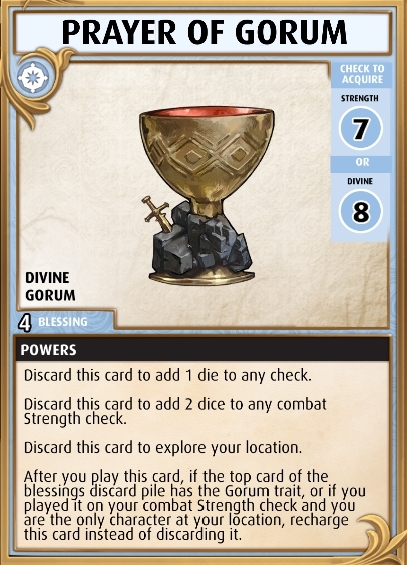 Clever characters in a party with Unity cards will hold blessings for each other to use, rather than keeping only blessings that fit themselves. For characters that always want to be alone, they can find solice in "Prayer" blessings. 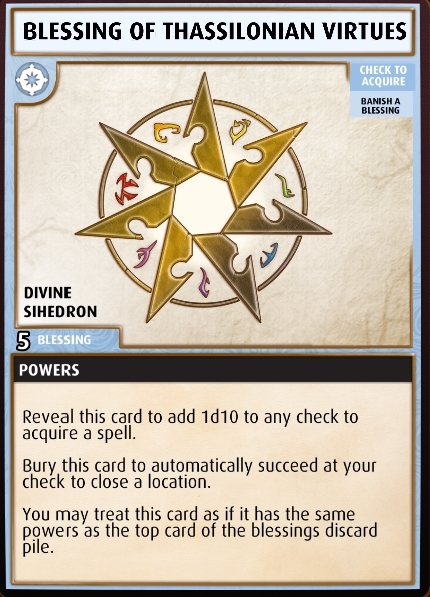 These are blessings for characters that need to be self-sufficient, and value the power of blessing the they can cycle through their deck. 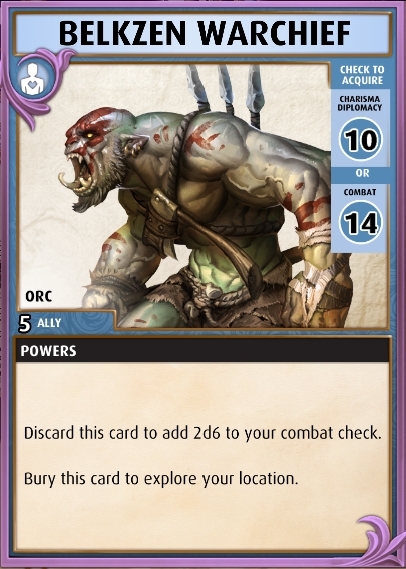 And as a bonus, we figured that it's about time you had the chance to ally with an orc. A show of force will bring him to your side, and he'll bring a savage beating upon your enemies. You'll be happy he has your back when you are facing your third villain in a row. Many of you are champing at the bit to go beyond Tier 3 in Quest Mode, we are working on a number of improvements, and unfortunately don't have the Tier 4 scenarios ready yet. We were able to get a big revision to our leveling system. You'll no longer get Basic cards for gaining levels anymore and each class has a customized advancement track. 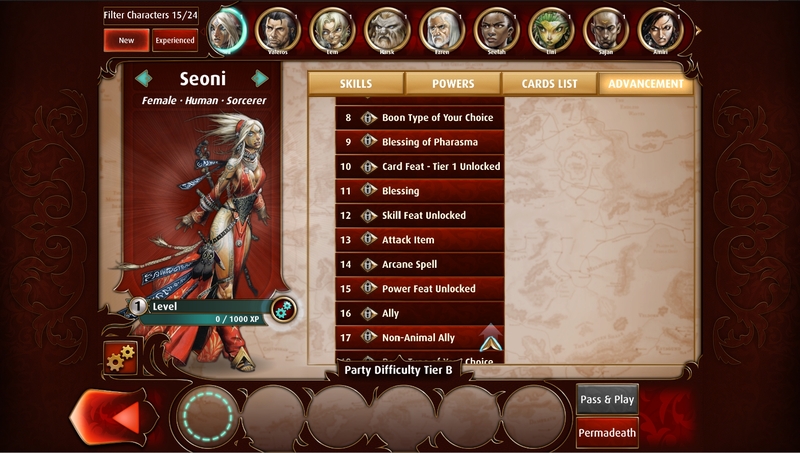 Here's a look at Seoni's! Note that she is no longer getting Weapons, Armor or Divine Spells. Instead she's getting some custom things like an Attack Item, an Arcane Spell, and a Blessing of Pharasma! By the time the Devs have finished spending their dev time adding unnecessary frippery and unneeded features instead of fixing the bugs in the game that make the game unreliable - adding "wrinkles" that defeat your best planning, planning that is based on the known rules rather than random screwage, the game will be playable - but I'll have already finished with it. Lovely! "thanks for beta-testing, mccrispy"
Of all these super-fancy things of which OBS is obviously so proud, the only thing that I care a fig about is "We were able to get a big revision to our leveling system. 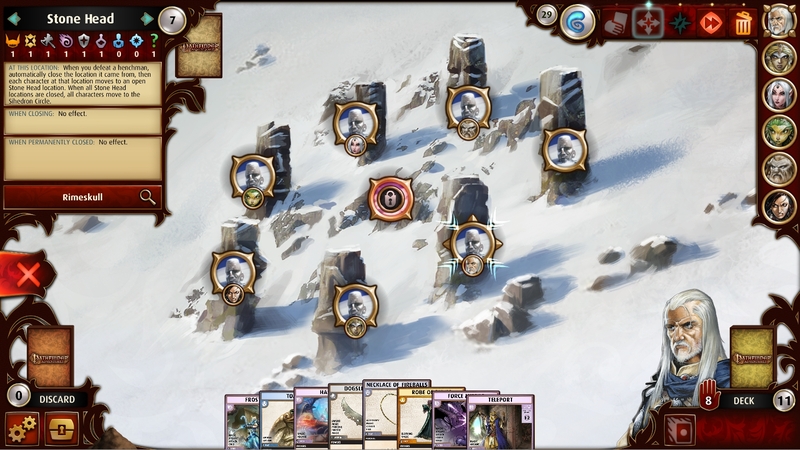 You'll no longer get Basic cards for gaining levels anymore and each class has a customized advancement track." And gaining Character-appropriate Boons for level rewards. Awesome! Congrats on getting that sorted OBS. Of course it should have been 2 AP-level patches ago... but I guess we should be grateful for small mercies. Though of course my Quest characters won't get the benefit of this, having already capped and wasted many, many Card "Rewards". → Deck 5, New Cards, and a Surprise!